For decades now, Canadians have been hearing there is a shortage of daycare spaces. It seems that no matter the city or province, the urgent-shortage storyline remains the same. In fact, the empirical evidence contradicts this narrative. In two jurisdictions—the City of Toronto and the province of British Columbia—daycare vacancy rates are persistent and growing. This article first examines the data showing daycare vacancies in British Columbia. Second, we’ll examine why those vacancies exist. Finally, we’ll discuss some of the possible reasons why we hear only about a shortage, and we’ll present new policy recommendations. It’s worth noting the term “vacancy” is not used. Instead, the Ministry of Children and Family Development presents the data in the form of “utilization rates”—the percentage of spaces used, rather than the percentage vacant. 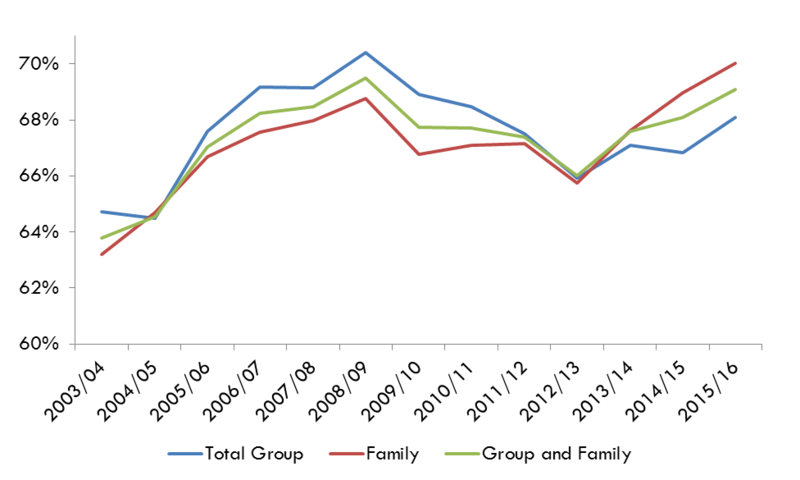 Utilization rates going back to 2003 are shown in Chart A, which is reproduced from the ministry’s report. *Source: Ministry of Children and Family Development. Performance Management Report. Volume 8, March 2016, p. 15. This is taken directly from the report. Note that the utilization rates have varied over the years, but have not surpassed about 70 percent. This means at their lowest, vacancy rates were 30 percent. The province is divided into thirteen service delivery areas (SDAs).6 Vacancy rates across those SDAs vary. The highest vacancies are in the northeast (42.9%) and the Kootenays (45.1%).7 Put bluntly, in the Kootenays, almost half of daycare spaces are vacant. The lowest vacancy rates are in Vancouver/Richmond at 24 percent. To emphasize the point, that means that in the area with the highest child care utilization rates, roughly a quarter of spaces are still available. The next lowest vacancy rates are North Fraser and South Fraser at 25.2 percent and 28.7 percent respectively. *Source: Ministry of Children and Family Development. Performance Management Report. Volume 8, March 2016, p. 17. The document shows utilization rates by service delivery area across the province, which we have converted here into vacancy rates. For children aged three to five in British Columbia, the average vacancy rate across the province is 28.7 percent. Across the province’s SDAs, the vacancy rates range from 21.5 percent in North Fraser to 42.2 percent in the Kootenays for children aged three to five. The vacancy rates for school-aged children are the highest, ranging from 41.5 percent in North Fraser to 68.6 percent in the Kootenays. Looking at these vacancy rates, some would argue there are plenty who want to find a daycare space, but they simply do not have the money with which to do so. Here we turn to examine budgeted subsidy dollars in British Columbia. The amount budgeted for child care fee subsidies in 2016/2017 was $119 million. The amount used was $105 million in the same year.16 This amounts to $14 million in unused, but budgeted subsidy dollars. WHY DO WE HEAR SO MUCH ABOUT THE STRESS OF FINDING CARE? Like many aspects of child-rearing, finding high quality, non-parental child care that suits a family’s situation can be stressful. However, given these data, it is clear that vacancies exist across the province. At the same time as there are vacancies, there are advocacy groups working hard toward increasing funding for non-parental child care. In the last provincial election, held in May 2017, the New Democratic Party ran on a campaign of $10-a-day daycare and the creation of thousands more daycare spaces, alongside the hiring of more early childhood educators. The Green Party promised free non-parental child care as well as $500 per month for parental child care.17 This has far more to do with ideology than need; there are many who believe the creation of publicly funded and run daycare is the only way to offer child care. It is not our intent to say that no parent has problems with finding suitable non-parental child care across British Columbia. Problems are likely for those seeking infant care in densely populated areas, for example. Finding high quality care for any age range, given that the quality of care in the majority of licensed daycares in Canada has been found to be inadequate, could likewise be a problem.18 That said, the idea of an outright shortage is demonstrably false when looking at the evidence for every part of the province. There are other relevant policy options. A better approach to child care would broaden its definition to include parents. Child care is the care of a child, regardless of how or where that care takes place. Governments should direct child care funding directly to parents, rather than building more spaces where they are not needed. Thus, preferential funding for centre-based care discriminates against those who cannot or prefer not to use that form of care and creates an incentive for parents to use the subsidized care. It is important to note that only 18 percent of children aged zero to four are in daycare centres or preschools, according to Statistics Canada.22 Government must remain neutral in its approach to funding child care options. Parents never pay the actual full costs for daycare, which are far higher than the fees, because all care in daycare centres and preschools is subsidized. The government provides funding for various operational and capital costs. Some facilities have additional subsidies, too.23 For example, the University of British Columbia provides rent-free premises and covers all janitorial and administrative costs at UBC daycare centres. Overturning this discriminatory discrepancy requires a look at the evidence and the desire to serve all parents and children, regardless of the forms of care they use. 3. Performance Management Report, 15. 4. Calculations based on “Group and Family” utilization rate. Ibid., 17. 6. Please check page two of the Performance Management Report to see what part of the province each service delivery area includes. 7. Calculations based on “Group and Family” utilization rate. Ibid., 17. 10. Calculations based on Performance Management Report, 17. 15. Performance Management Report, 20. 16. Dayna Slusar, Cardus researcher, in phone communication with Kelly Douglas from the British Columbia Ministry of Children and Family Development, November 28, 2017. 22. Calculations by authors based on data from Sinha, Table 1, 7. The calculation of the 18 percent is based on all children including those who are in parental care. According to the Sinha report, 54 percent of parents with children aged four and under used regulated child care (4). Sinha’s Table 1, 7 says 33 percent of children aged four and under whose parents use child care are in a daycare centre. 23. Performance Management Report, 22. This shows $210.029 million total expenditure subsidizing non-parental child care; the fee subsidy portion is only about half of the total at $109.037 million. 27. Child Care Choices. http://www.child carechoices.ca/main/Resources/54/http://www.child carechoices.ca/main/Resources/54/ The sub-categories for “licence not required” care include: “registered licence not required” care, “unregistered licence not required”, and care in a child’s own home.